When you get to be 91, sweetheart—you tend to lose some strength,” Dr. Lou Tedone said, his voice tinged with good humor and the whisper of a Brooklyn accent. 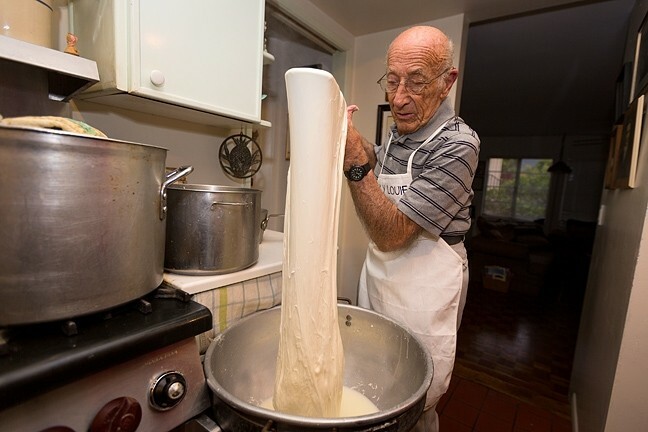 LIKE RIDING A BIKE: Lou Tedone, 91, grew up making mozzarella cheese at his parents’ shop in Brooklyn. For the past 25 years, he’s risen at dawn to make flavorful batches every day. Despite my foggy morning demeanor, I laughed whole-heartedly at these wry observations. Not just because Tedone has a way of wiggling his eyebrows when delivering wisecracks—just ask him how he and his late wife, Grace, managed raising nine kids—but because it’s sort of absurd, too. What “Lucky Louie” may have lost in muscle and manpower he has certainly made up for in strength of will and mind. In other words: Gravity ain’t got nothin’ on old Doc. Tedone. 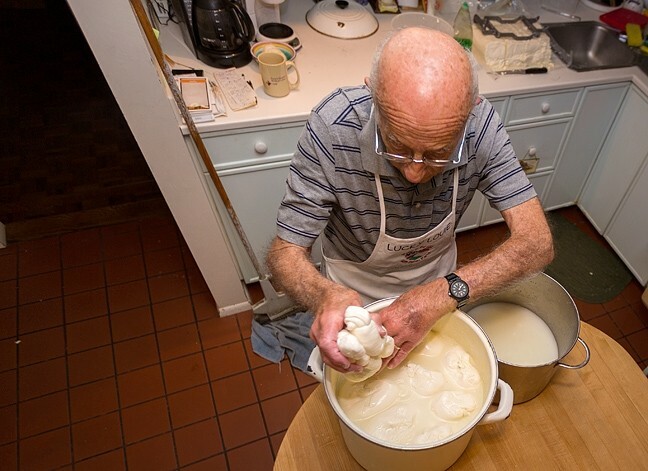 For the past 25 years, the retired pediatrician has risen at dawn to make mozzarella cheese. His house, purchased in 1954 near Cal Poly, is tidy and filled with framed photos of Grace, “the everlasting love of his life,” their 22 grandchildren, and three great-grandchildren. A 2002 U.S. Olympic Torch is displayed in the living room (at the age of 84, he carried that flame). Tedone performs more sit-ups and push-ups a day than most of the New Times editorial staff manage to do in a year. “I know that this is what you really came for,” Tedone said as he slapped a smooth, round ball of cheese on the counter. By God, was he correct. But remember: With great cheese, comes great responsibility. To find out, we must travel to Brooklyn, where Tedone’s parents opened their own mom and pop (or as the doc likes to say, “momma and poppa”) deli. The whole family, including Tedone’s two brothers, lived behind that neat, little well-stocked shop. In many ways, the senior citizen is carrying on an unshakable family duty that he picked up as a youth. In May 1941, the beloved patriarch of the family passed away, and the three Tedone brothers took turns waking up at 6 a.m. to make the cheese. Only a few months later, another shockwave rocked the family: Pearl Harbor. These two words changed life for so many families, and the Tedone clan was no different. A program helped pay for Tedone’s first three years of study—a huge break that would change the trajectory of his life forever. Despite medical school homework and residency duties, Tedone continued to rise early to make mozzarellas for the family business. “It’s what we had to do,” Tedone said simply. Isn’t it funny how members of The Greatest Generation have such a concise way of putting a millennial’s sense of shock to shame? After a few years of training and early morning mozzarella making, Tedone graduated and began practicing as a pediatrician. He and his blushing bride were the parents of two bouncing children. A bright future lay ahead. Surprise, surprise: The Korean War came knocking next—this time in the form of a “doctor draft order” that landed Tedone at Camp Roberts. In a few words, Tedone was pissed off. However, what could have been a horrible separation actually lead to a fortuitous new home for the budding family. Working for French Hospital Medical Center in 1953, Tedone became San Luis Obispo’s very first pediatrician. For the first eight years of that hectic time, Tedone said he was on call 24/7 with zero backup. A strong, capable woman, Grace stayed home with their nine kids, and together, the couple made a happy life together. The house was alive with laughter, kids, and true love. Around 1990, Tedone’s son-in-law urged the retired doctor to take up his mozzarella craft once again. And so, Tedone went back to his old, beloved routine. 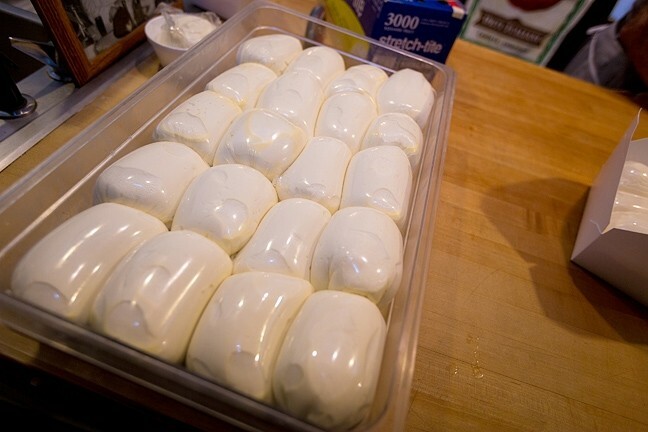 The process, which requires chopping up commercial mozzarella curd, submerging it in boiling water, wrestling the rubbery mound into smooth submission with a wooden paddle, and dropping the balls into a salt bath—not to mention measuring and timing each step just right—has kept Tedone sharp. MOMMA AND POPPA LOVE: Lucky Louie Tedone’s son-in-law has carried on the Italian deli tradition. Stop by Depalo & Sons for an array of freshly-made sandwiches, mozzarella cheese, and Italian delicacies that would make Tedone’s own momma and poppa very proud. The store is located at 2665 Shell Beach Road in Pismo Beach. Got cheese-making questions or comments for Doc Tedone? Email him at lmtedone@earthlink.net. In 1994, Grace passed away from cancer. Still, Tedone continued to contribute to the community through myriad causes, including serving on the board for SLO County’s first mental health clinic, which he founded. And—of course—he still made the cheese. Amazed, I watched as the unruly cheese took form in Tedone’s hands, and I was struck by their age as well as their ability. His hands have given healing comfort to countless children, including his own. They held his wife’s hands for decades of wedded bliss. They still wear the gold wedding band, and it flashed in the water as he tugged at the white blobs of curd. Tedone’s nimble fingers can produce round orbs and intricate braids (he likes to eat the braids for lunch with tomatoes and crostini). They can slice the finished cheese, wrap it tightly in plastic, and deliver it to a neighbor or friend. In other words, they can bring immense joy with the flick of a wrist. This is the life of Lucky Louie, who wears an apron emblazoned with that nick-name. It is an apt description, to be sure. Hayley Thomas is inspired at hthomas@newtimesslo.com.